CNC technology offers complex and accurate machining methods for most rigid materials. Compared to laser technology, 3-axis CNC machining makes it possible to process 2D by cutting as well as making more or less protruding volumes by using the Z-axis movement of the machining tool. Three-axis CNC machining can produce contoured or profiled edges and even straight or rounded or irregularly shaped straight or flat cuts in the thickness of the material. You can benefit from this technology either independently, by ordering CNC cutting and CNC milling services, either by ordering production and or design services for objects whose optimal execution is represented by CNC machining. What are the applications of CNC prototype machining? The use of CNC technology for the processing of materials has applicability in various fields. These fields will require the existence of some production stages. The multitude of parameters that can be controlled makes CNC machining possible to produce complex and accurate contours or volumes, made of rigid materials and often of high thickness, difficult to process by other emerging technologies. You can rely on the advantages of laser technology when you want to cut or mow the right materials in order to obtain: parts with medium or large dimensions in exact dimensions, rigid pieces with thickness between 1-90 mm , rigid materials that are not compatible with laser processing (for example containing PVC) or 2.5D volumes of various materials. The areas of applicability of CNC processing are mainly: Architecture, Art, Design, Scenography, Advertising production, Presentation models, Engineering or Custom furniture production. Cutting CNC with milling represents the mechanical cutting of the material using tools of various diameters, depending on the thickness and density of the material processed. We usually use cutting cutters with thicknesses greater than or equal to 3mm and the increase in the diameter of the machining milling cutters results in increased joining radii of the contours, fewer passes necessary for punching the material and implicitly lower processing costs. 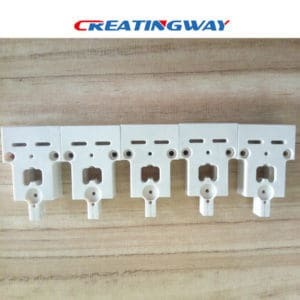 The color of the cut of the material mechanically machined with the cutter is usually the same as that of the unprocessed material, and in the case of glossy materials the edge matures. Channel and profile milling is actually a line-engraved machining with milling cutters of various shapes and diameters. It is possible to achieve, based on line drawings, fingerprinting with depth and controlled channel widths or edge processing with various profiles. Parameters that determine the shape of the milling are: the depth of processing that determines the depth of the groove, the diameter of the milling cutter that determines its width, and the shape of the cutter used to determine the different profile of the straight, V-shaped, rounded or even complex profiles of special shapes . Unlike laser engraving, engraving with the cutter does not change the color of the material. Surface milling or grinding / finishing is the process by which the material is thinned on desired areas with a constant depth and in a form dictated by the machining drawing. Depending on the milling cutter used and the number of passes on the material, machining can be done faster or slower and with varying degrees of fineness. Like the line engraving, the native color of the material will remain the same in the machined areas, and the diameters of the cutters used will determine the radii of connection to the intricate corners of the engravings. Projects indicating surface milling will also have depth indications of machining. The machining modes of the machining tool on 3-axis CNC machines allow, besides 2D machining, and 2.5D machining, that make volumes possible with straight or tilted planes at different elevations. Basically we can get a series of 3D volumes with certain conditions, of which, the main thing would be that the machining tool can be sculpted in the material coming from above. Such volumes involve more complex operations and can be obtained based on models designed in 3D modeling software, from materials with relatively constant density and whose milling can lead to obtaining fine surfaces – polyurethane foams, solid wood, MDF etc. This is what needs to be known in regard to CNC processing and the options available in this niche for CNC prototype machining. In order to start the process on your own, you will need the materials and knowledge of the chosen niche.